Scalable Vector Graphics (SVG) is a W3C standard for drawing vector images. SVG can also be embedded in HTML, in which case the xmlns attribute is not required. CSS is used for styling although not all CSS properties apply to SVG and SVG itself defines some specific properties such as fill and stroke that are not used elsewhere. Shapes can be filled with gradients or patterns and additional raster effects can be achieved using filters. Clipping is available by using the above graphical elements as clip paths. 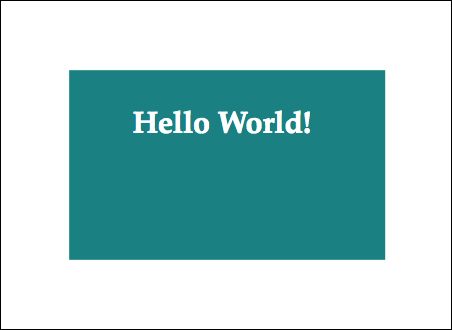 Inline SVG allows SVG markup, written within HTML, to generate graphics in the browser. The <svg> fragment above acts as both a container and a structural element. This fragment establishes its own coordinate system. Below is an example of rendering an SVG fragment with some content. It will produce a rectangle with "Hello World!" text within it. If the dimensions specified in your SVG file are larger than the dimensions of your HTML element, it may be desirable to specify the background-size property, to scale the SVG to fit within its element. Browser support doesn't include Internet Explorer 8 and earlier versions, nor Android 2.3 and earlier versions. You can't style the individual elements contained within the SVG file using CSS which is external to the SVG file. All CSS must be within the image file itself. The dimensions of the image will, by default, display according to the width and height properties specified in the SVG file referenced in the src attribute. Browser support, whilst good, doesn't include Internet Explorer 8 and earlier versions, nor Android 2.3 and earlier versions. The image must be complete in a single file. For example, if the SVG file contains raster images then those internal images must be encoded as data URLs.